Before its launch during first half of September 2015, Mahindra is actively teasing various photos of their much awaited Mahindra TUV300 compact-SUV. The TUV in “Mahindra TUV300” stands for “Tough Utility Vehicle”. Mahindra TUV300 is a sub 4 metre compact SUV which comes with a 5+2 seating capacity. 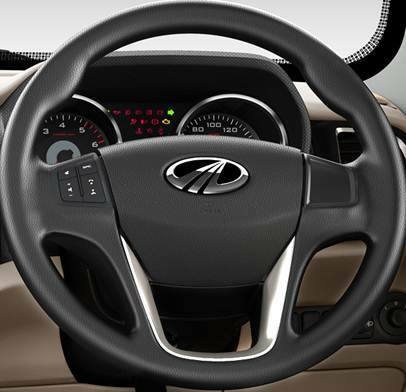 The interiors of car comes in dual-tone interiors with Black & beige combination. The car comes with steering wheel with silver accents. The audio controls are also mounted on steering wheels. There is plenty of tell tale lights in the instrument cluster. The AC vents of the car has silver accents. The stereo is powered by Bluetooth. Mahindra TUV300 is based on all new platform. TUV300 has been designed and developed internally within the company and the research and development aspects has been carried out at the world class Mahindra Research Valley (MRV) in city of Chennai. Mahindra TUV3OO is going to be powered by new mHawk80 diesel engine. The “80” in the engine name would hint that the car is capable of delivering 80 Bhp of power.